VOLNEY – Students at Volney Elementary School earned recognition during a recent assembly for exhibiting responsibility during the month of October. 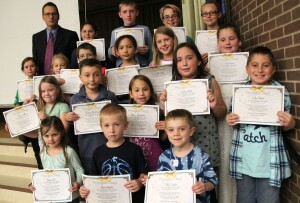 Volney Elementary School students who exhibited the October character education trait of responsibility are pictured with Principal Todd Terpening, top left. Absent from the photo are recipients Emilyn Moshier and Devin Catalone. During the assembly, Principal Todd Terpening defined responsibility as making sure someone is doing what they are supposed to be doing and seeing tasks through until the end. 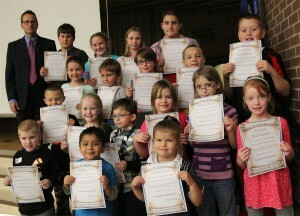 Brynn Graf, Emilyn Moshier, Devin Catalone, Ayden Bigelow, Callen Cowden, Liberty Allard, Zackery MacDougall, Olivia Hendrickson, Audrey White, Colten Norton, Tristan Graham, Jaya Whitehead, Laura Bartlett, Evelyn Rupert, Kaeli McCarthy, Nick Shaw, Elle Lone, Sarah Nichols, Paige Kingsley and Marissa Bowering. Principal Todd Terpening, top left, joins Volney Elementary School students who were recently recognized with monthly “On-a-Roll” Model certificates. Absent from the photo are recipients Jayden Hamilton, Branden Garner, Austin Miner, and Jayden Palmiter. The monthly “On-a-roll” models were also announced for their outstanding effort and improvement during the month of October. Aurav Khera, Brydon Taber, Jayden Hamilton, Branden Garner, Jazelle Cruz, Laila Thompson, Nate LaBeef, Anna Miner, Joseph Smith, Jr., Emma Hutchinson, Haley Taplin, Ava Ditton, Austin Miner, Makenna Grant, Caden James, Lucas Smith, Kameron Przydgen, Addison Pickard, Kyle Bort, Alicia Collett, Mariah Sherman and Jayden Palmiter.